The Qualifiers are the main talking points from the weekend’s action. Widnes Vikings face a very, very tough climb to stay in Super League now. Francis Cummins’ side gave away a 14-4 lead against Championship side London Broncos on Thursday and lost 21-20 due to a last-minute drop-goal from Jarrod Sammut. Having already lost to one Championship outfit at home, their fixture list is now looking grim. 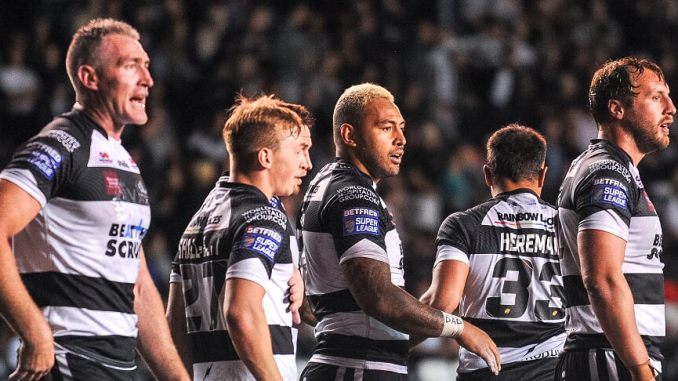 They face Halifax and Leeds Rhinos at the Halton Stadium and face enormously tough trips to Toronto Wolfpack, Toulouse Olympique and Hull Kingston Rovers. It is not looking good at all for the Chemics. London Broncos proved on Thursday night that they are not just in the Qualifiers to ‘make the numbers up’. Danny Ward has done a magnificent job since taking over the reins at the capital club from Andrew Henderson in the off-season. They finished second in the Championship table after the regular season and they fully deserved their place in the Qualifiers because they play some great to watch attacking rugby. Jarrod Sammut is a one-off star and it makes you wonder why he hasn’t been a Super League player since 2015. Jackson Hastings could well be the difference whether Salford Red Devils stay in Super League or not. The 22-year-old has been an instant hit in Super League since he arrived last month from Manly Sea Eagles. Hastings single handedly inspired Salford to a win over Leeds Rhinos in his debut and put in another man-of-the-match display on Friday. Hastings’ game management was superb in Salford’s crucial 28-10 win over Hull Kingston Rovers in the first round of the Qualifiers. He has a solid relationship with half-back partner Rob Lui too, so the Red Devils are certainly rising at the minute. What a shame it is that Simon Woolford couldn’t have arrived at Huddersfield Giants a month or two earlier – they would be in full contention for a spot in the top four! The Australian has done an outstanding job since he made the switch to Super League. They have won seven out of their last eight games, with some of those victories coming against the likes of Wigan Warriors, Castleford Tigers and most recently St Helens. Woolford has worked wonders since he came in, but they are still six points behind fourth-placed Warrington Wolves and it looks unlikely that they’ll get in the top four, but what a great job he has done though. There were a total of nine debutants in the Super 8s on the weekend and they went well by all accounts. Lewis Bienek (Hull FC), Ollie Partington (Wigan), Robin Brochon, Ugo Martin, Arthur Mourgue (Catalans), Suaia Matagi (Huddersfield), Bodene Thompson (Warrington), Joey Lussick (Salford) and Charlie Gubb (Widnes) all played their first games for their respective clubs. The picks of the bunch have got to be Partington, Matagi and Lussick though. Partington made a big impact for the Warriors in two stints. He even put a huge hit on Tigers forward Adam Milner. Despite getting a shot put on him early by Mark Percival, Matagi went on to have a solid debut for the Giants and racked up a lot of metres. Lussick was very effective out of the ruck for the Red Devils in their win at Hull KR and even bagged a try as well.